So many cultures celebrate a mid-winter festival, in both ancient and modern times. The Winter Solstice is one of the four fire festivals, the time when in the Northern Hemisphere, the night is at its longest and the day at its shortest. To our ancestors it was a crucial time; the sun reached the point in the calendar where it apparently ‘stood still’ in the sky (the literal meaning of the word ‘solstice’) before beginning the return to longer days and shorter nights. This was very significant to people whose survival centred on growing enough food and keeping warm. If you watch the sunrise and sunset from the same spot, you’ll be able to mentally mark your own solstice alignments – the point where the sun rises and sets on its shortest day. Stand in the same place on June 21st and compare these winter points to where the sun appears and disappears at the Summer Solstice. You’ll realise the huge difference the Earth’s tilt and orbit makes, although to our ancestors of course it was the sun which appeared to move. So many of our modern Christmas customs date from pagan times. 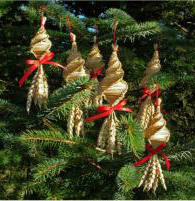 Evergreens have always been part of the decorations for this festival; holly, ivy and fir. Mistletoe was sacred to the Druids and a venerated plant. Light, candles and wreaths have always been important for Yule, and the word ‘yule’ comes from Old No rse ‘jul’, meaning ‘wheel’. Christingles, St Lucia and St Stephen all have their roots in ancient customs celebrated at this mid-winter festival. Even Father Christmas is said to perhaps have morphed from the shaman who would play a vital role in the proceedings in the Northern Hemisphere. Some early art depicting this mid-winter benefactor portrays him in green robes – maybe a version of the Green Man? Herne the Hunter was a horned deity sacred to this time of year – a man with antlers sprouting from his head. Wassailing, when the orchards would be visited by bands of singers performing rituals around the trees, singing and drinking from a Wassail Cup to toast the trees, was to ensure their well-being for the year ahead. Perhaps this custom was a forerunner of the bands of carol-singers who once traipsed around the village. What a mixture of cultures, beliefs and customs! 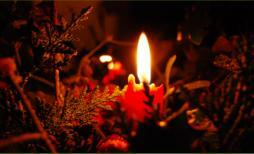 At Stonewylde, the festival of the Winter Solstice and Yule is celebrated with fire and light. Candles are lit everywhere, a massive Yule log is decorated and lit in the Great Barn, which smoulders throughout the twelve days of the festival. The ashes of this are ploughed into the fields at Imbolc, along with the remains of Lammas corn dollies, to ensure fertility for the coming year. Evergreens are brought into the cottages and the Barn, particularly holly to represent the Holly King, who traditionally dies at this time to be replaced by the Oak King. Mistletoe is the sacred symbol, full of ancient and mystical significance. As a traditional, non-commercial community, Stonewylde doesn’t indulge in a shopping frenzy and no gifts are exchanged. But children hang a green woollen sock by the hearth and the Yule elves come out of the woodlands at midnight to fill the stockings with nuts, fudge and little hand-made gifts. Every cottage hangs an evergreen wreath made from woven holly, ivy and mistletoe on the front door to symbolise the never-ending wheel of the calendar. A candle in a lantern shines from every cottage parlour window to welcome back the sun and the Oak King. In the Great Barn there’s feasting, dancing and party games every night during the Yule festival, which begins with a huge bonfire ceremony at the Solstice in the Stone Circle. All celebrations at Stonewylde begin here – the heart of the community.